Didn’t see a post on it yet. However the new update for iMore Forums app for the X is actually quite nice. I would like to know why they decided to go with goldish yellow for their brand color. Thank you devs. It’s a nice update. The Yellow is horrible, IMO! Premium1, prefab, BreakingKayfabe and 1 others like this. At first I thought the yellow is horrible, but after I have been using it, it doesn’t bother me anymore. I like the update so far. I'm sticking to TapaTalk. I can't hardly read the white text on the yellow. Not very good contrast at all. tadpoles, prefab, kataran and 2 others like this. I used to use the Tapatalk app, but I prefer the dedicated iMore app myself. I think you will probably see a future update where they will tone down the yellow a bit it or even change it to a neutral color and make everyone happy. Just a hunch. I have tried Tapatalk. But I just cannot get used to it at all. I would hope for a blue theme iMore. Maybe in the next few years rebranding? That's interesting because the iMore Forums app is Tapatalk, just scaled down to specifically iMore and missing some options and features. I installed the new iMore Forums app and it lasted on my iPhone for less than 2 minutes. The yellow is way too bright and distracting for me. Last edited by Just_Me_D; 01-28-2018 at 07:04 PM. prefab and Lee_Bo like this. Is it? I find the iMore app easier to use. I need to use Tapatalk more to more easily use some other forums I venture instead of using their websites. Yeah, Tapatalk supplies the template app. Well now I just feel dumb saying what I said. I may have to give it another go. Anybody know why the iMore Forums app wants to ask for my location? I have denied it access but find it funny a forum app needs location data. If you want night reading mode to activate automatically at sunset it needs your location to know your timezone and sunset time. EDIT: There are a number of people who prefer the dedicated forum app to Tapatalk. I browse multiple forums so Tapatalk is only choice unless I want to browse online. Not even going to lie. I didn’t even know night mode was an option. That makes since though and answers my question. Any idea why we can't view the "who's online"? When I tap on it, it says I don't have enough permissions to view it. Why would one need permissions to view that? Although the iMore forums app is tapatalk, it's not as bloated as tapatalk is. I find myself navigating more quickly with the forums app. Tapatalk has consumed a lot of sugar over the years. I'll follow up on this, but I'll give the updated app a try. I still prefer full blown Tapatalk, through. Still looking like TapaTalk for the win. 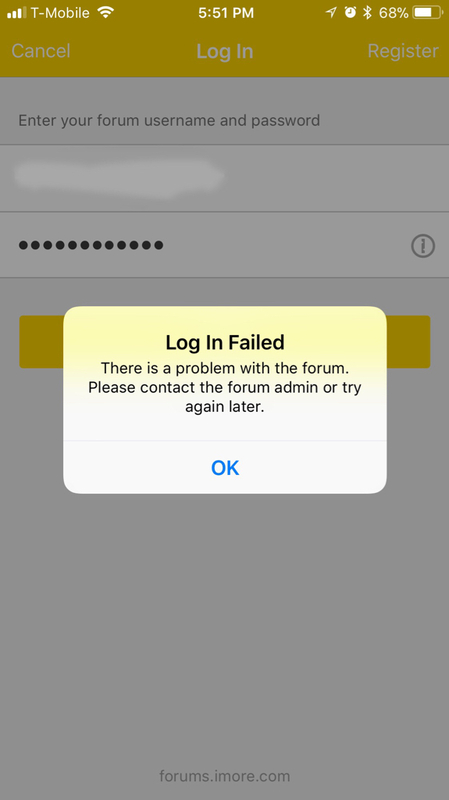 Using the exact same credentials that I use on the website and with TT but can't log in. I was under the impression that that particular option was discontinued. I read it somewhere.